~ All images are printed using top of the line UV resistant latex inks that actually etch into the vinyl. This means the image will not flake off of the spare tire cover like air brushed or painted spare tire covers. Our inks are rated up to three+ years! 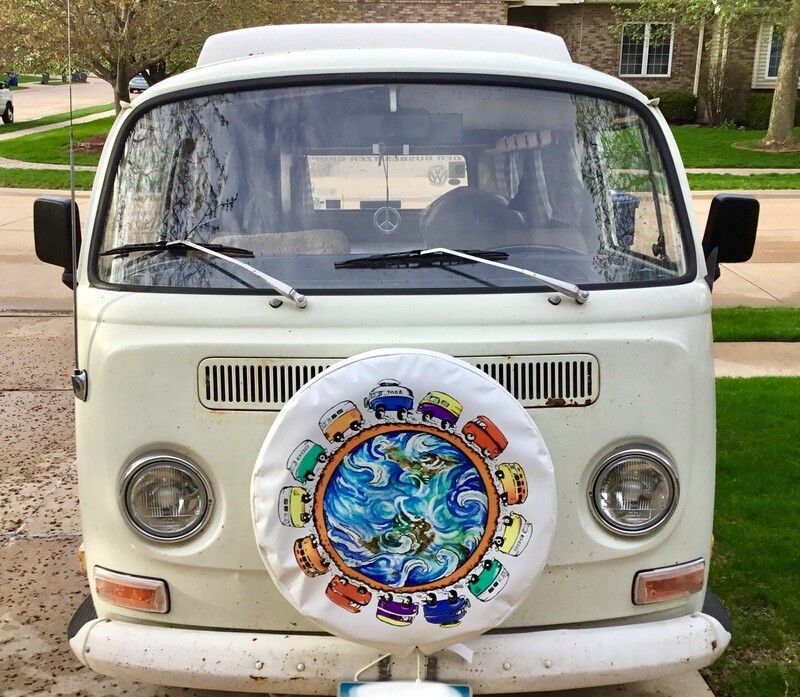 Are you asking yourself what size you need for your 13 VW bus spare tire cover? 13 Hippie buses in multiple colors circling the earth. Your size is printed on the side wall of your SPARE tire and can be found below the tire name brand. There is no need to measure. Please be sure to check the size on the spare tire, because sometimes the size on the spare tire is different than the size of the tires mounted on the vehicle. For example P255/75r17 or 30×9.50×15 or H78-14. 1-In the middle of the 13 VW bus spare tire cover detail screen is a SIZE field where you can enter your tire size.